Back to lazy jacks. You say you want lots of detail, so this is what I do on Blue Mistress to lower and stow the sails before returning to the mooring where I would restow everything that needed restowing. Put on your life-jacket and/or tether if you aren’t wearing one or the other already. The rule is: if the situation is such that you are beginning to wonder whether you should wear them – put them on. Many people wear them all the time. Make sure you are out of the main fairway, and any traffic. Avoid the racing fleets. They appear en masse from nowhere. You need enough sea-room to drift downwind. It takes longer by yourself – (not always true, ed.). Keep an eye out for where the boat is and other boats are nearby. 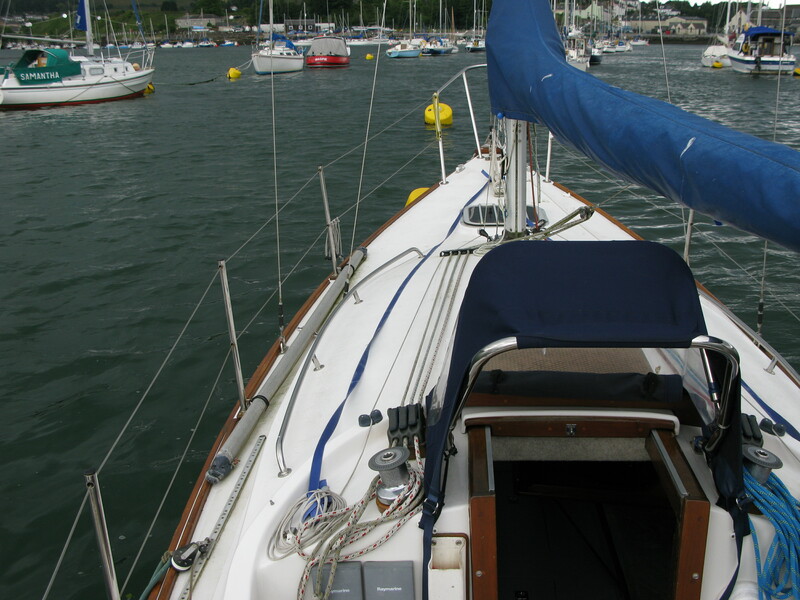 Set the self-steering – by the time we get to downing sails, the self-steering gear on Blue Mistress has been stowed. I have a short line with heavy bungee loops at either end. The loops slip easily over the quarter cleats and and three or four coils of the line on the tiller will hold her on course for as long as it takes to go forward and return to the cockpit. The long keel helps. Check that the way forward is clear – particularly the step onto the coach roof. One of the reasons for the upright ‘come-in’ on Blue Mistress rather than a wider sprayhood is that it makes it easy to step from the cockpit to the coachroof. Being older and less athletic, I need all the help I can get. If the lazy jacks have been stowed against the mast as in the image below, you will have to free them from around the mast cleat and reset them. So, first, you have to free the lazy jack lines from the jamming cleat next to the cockpit clutches. Now let go the fore-sheet and free the foresail halyard. Back to the cockpit. As you do so, check the lazy jacks are not caught up on the sail or boom. Tighten the port fore-sheet to secure the clew of the foresail. Then tighten the topping lift, lifting the boom so that it will clear the sprayhood. This may mean releasing the vang and the mainsheet if close-hauled. Tighten the lazy jack lines as far as they will go, slipping them into the appropriate jamming cleats. The lines on the lee side of the sail will tend to flatten it. You may not be able to tighten these perfectly – meaning they will be loose when you drop the sail. This shouldn’t be a problem. They will hold the sail anyway. Collect the sail ties from the locker and disentangle them. If you stuff them in your pocket, pulling one out is likely to pull the whole lot out leading to a mad scrabble on the deck to stop them going over the side. And threading them through your belt can result in two or three coming out at once. Work out how you’re going to use them. To drop the mainsail on Blue Mistress, the boat has to be headed into the wind. At anything over five degrees or so off the wind the sail slides will jam against the mast and the sail will be caught partly down. As the bow falls further off the wind, so the sail will start to drive the boat forward, jamming the slides even more. There is no choice but to return to the helm to bring it back into the wind. 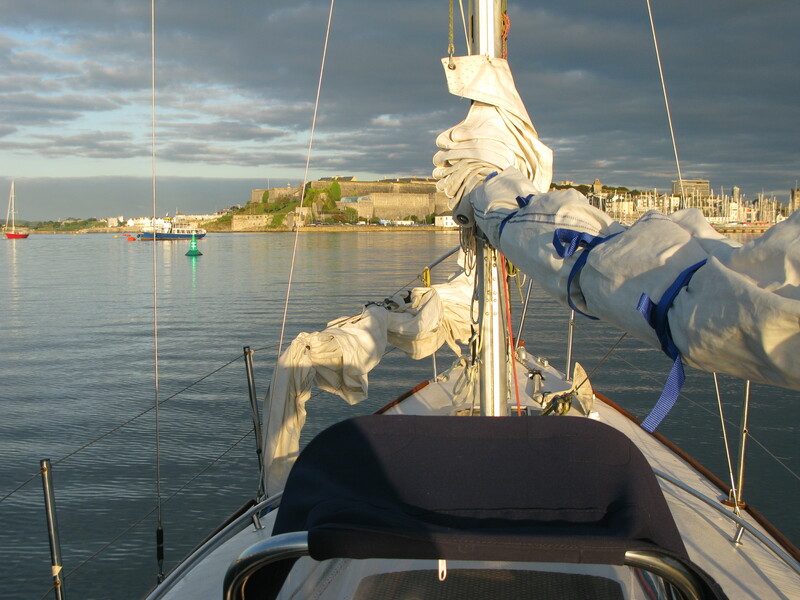 Move to the forward end of the cockpit, release the clutch holding the main halyard and let the sail start to drop. Attach the tether to the jack line, step onto the coach roof and go forward to the mast. This reduces the chance of the boom knocking you over but also, as mentioned above, the sail needs to be pulled down the mast in a hurry before the slides jam. You will feel the bow begin to fall away as the boat slows to a stop and the wind catches it. The trick is to get the sail down and under control before the bow starts to fall away. The lazy jacks are there to hold the bulk of the sail close to the boom. Without them the folds of sail will tend to blow over the side and, in a blow, it can be difficult for one person to bring it back under control. It’s not impossible, it’s just easier and safer with the lazy jacks when single-handed. (By the way, the sail battens will not necessarily fall evenly and they will need to be aligned with the boom fairly swiftly). At this stage, the boat should be lying quietly and the sail can be carefully furled. 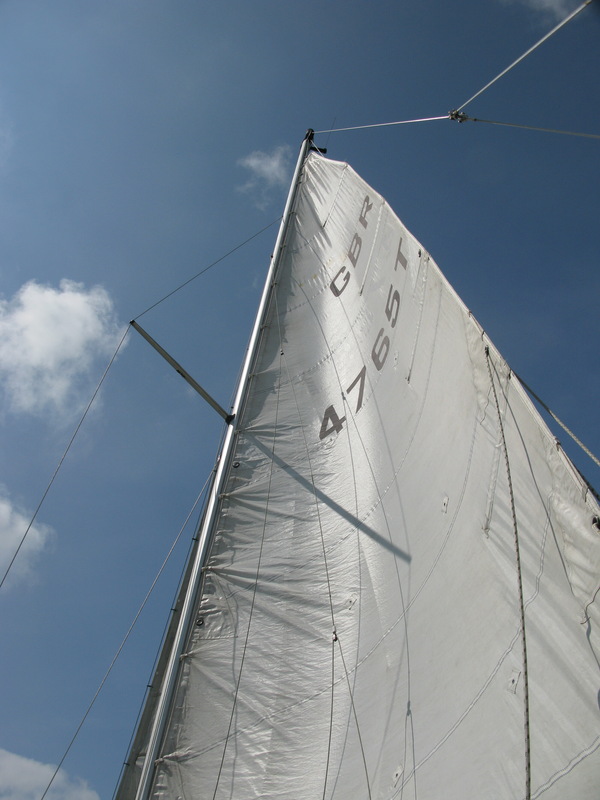 Make sure the sail folds of the sail formed by the slides are all on the same side, then, working from the mast along the length of the boom, take a two foot wide section of the foot of the sail – (hammock-like), and fold it over the bulk of the sail, aligning the battens and tucking the reefing lines into the folds as you go. The sail ties are turned round the bundle with the loose-end tucked under the turn so that they can be easily released if the engine fails and you need to sail again before you get to the mooring. It also leaves them ready for the next time you sail. And all the above assumes that you know the engine is going to start so that you can motor back to the mooring. The one time I didn’t check before stowing the sails, the engine refused to start . . . that’s another story. That’s all there is to it, George. If your eyes have glazed over, I’m sorry, but you did ask for detail. Have I got images of each stage? You’ve got to be joking! I’ll tell you the few problems I have had next time.